Commercial logging in British Columbia dates back to the 1820s when timber was predominantly used for masts on ships. By the 1860s, export production increased with the establishment of many saw mills on the southern end of Vancouver Island and the Burrard Inlet. The coastal forests of the region offered enormous trees, high wood per hectare as a result and proximity to the ocean for transportation. The gold rush in the Cariboo region began to open the area up with the building of roads. As the population increased in this area it also created the demand for timber, heating, cooking, housing and commercial establishments. Just as rapidly as the gold rush boomed it busted, and many of the settlements were abandoned and demand for resources decreased rapidly. However, new discoveries of silver, coal and other minerals to mine renewed demand for timber in the Interior. It was around this time (1886) that the Canadian Pacific Railway was completed which led to a stable export market to the Prairies and central Canada for the Interior timber mills, specifically those in Lytton, Kamloops and Revelstoke. The Kettle Valley railway line, Grand Trunk Pacific and the Pacific Great Eastern continued to open up BC and increased further the demand for Interior mills. Communities were no longer solely relying on the rivers and lakes for transportation. Prior to the expansion of the railways, transportation had been one of the major barriers to the interior timber harvest. The introduction of the combustion engine ended the linear pattern of logging. Bulldozers and trucks could get to almost any logging site, and by the1940s trucks became the main source of transportation, which continues to be the case today. Further advances in technology included the double-bladed axe and the Swede saw, which later became the chainsaw. The spar tree and steam donkey, or donkey engine (the common nickname for a steam-powered winch, or logging engine), became a mechanical spar pole that could be brought to any site. The mechanical spar pole used hydraulics to raise the pole and a combustion engine to run the winch. 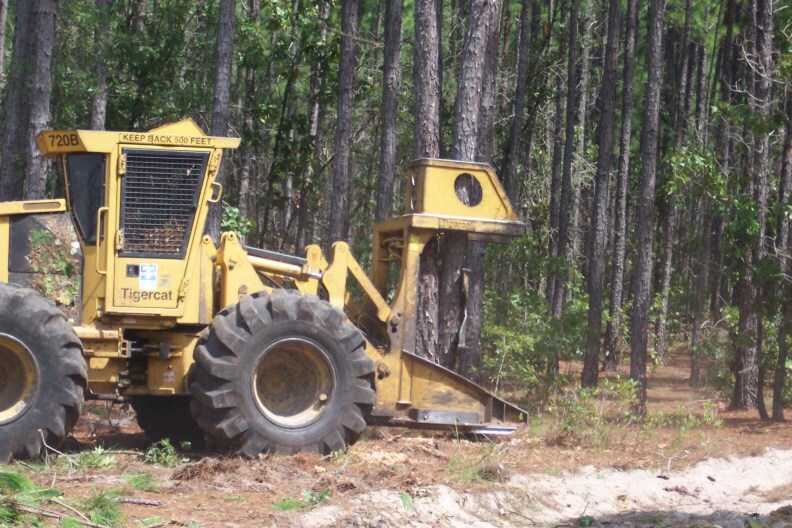 The technology was further enhanced with the feller buncher, a machine with metal tracks that cuts limbs and stacks logs all at once. The depletion of the accessible forests led loggers further into the forests and up the slopes of the mountains. New methods for log booms were necessary as old rafts were not suitable for the rougher seas. The Davis raft was useful for preventing breakup but was replaced by a much better barge system (self-loading and self-dumping), which proved to be faster and decreased log loss. In remote areas, helicopter and balloon logging began, although this was very expensive. Mills switched from labour-intensive to capital-intensive entities, and all aspects of milling began to be automated: debarking logs, saw milling, grading and green chain (an assembly line of fresh-cut timber). By the 1980s hydraulic barkers and new band saws with laser directional beams were introduced as well as an automated green chain. 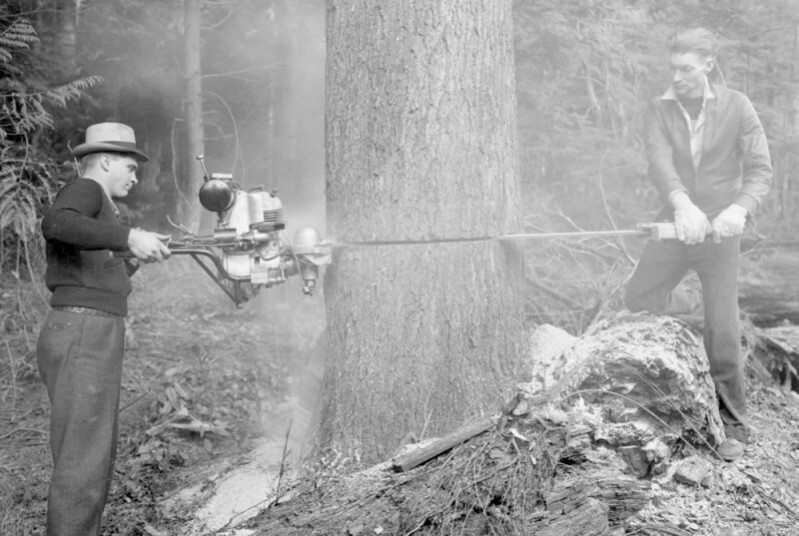 History of Commercial Logging by Geography Open Textbook Collective is licensed under a Creative Commons Attribution 4.0 International License, except where otherwise noted.